Since I work four days a week I try to maximise my time off to do as many things as possible with the boys. I still have to catch up with the cleaning and shopping, but they help or play with their toys for a bit. One thing I love to do is bake. I always get the children involved and they love to bake too. They have their own aprons, utensils, etc. Baking is a great way to do something together, you have fun making the items and have even more fun eating the items. We don’t always make sweet things, savoury items are good too. 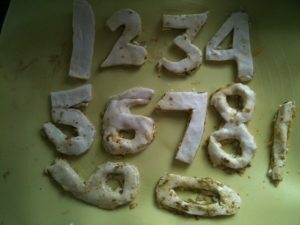 We are teaching our four year old numbers at the minute. So I decided to make some pastry numbers with him. Making pastry with children is never good it takes to long and they get bored, so I cheat and use frozen. Ok, I know not as good but lets face who can make puff pastry with kids? Together we rolled it, added some yummy Pesto and then some cheese. Both children loved that part, getting their fingers in (clean of course) and spreading it all out. Another layer of puffed pastry on top and we were done. Now to cut out the numbers, which I did by hand. 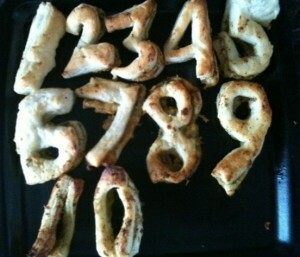 I got my four year old two draw the numbers on the pastry with his fingers and tell me which one came next. So it was a team effort. When they came out of the oven, he named all the numbers and we placed them in the right order once cooled. They did smell and taste so good. My youngest who has just turned two is trying to learn colours. So for him, I made some fairy cakes. 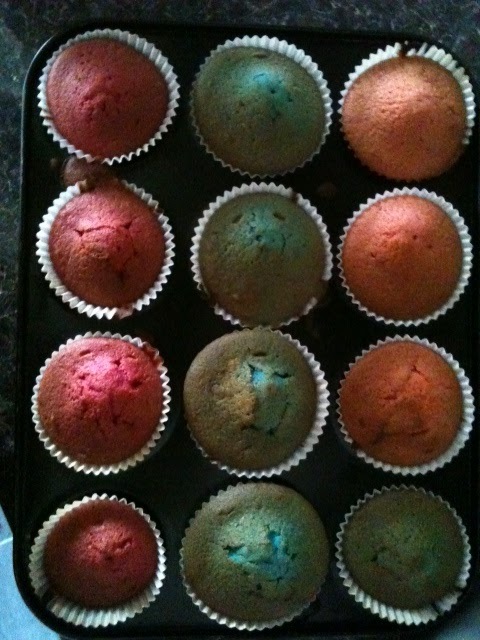 Ok I know what you are thinking, how can he learn colours from fairy cakes? Well you would be surprised. I got both boys to help me put in all the ingredients for fairy cakes into a bowl. I mixed it up with an electric mixer. I then separated the mixture into three bowls. 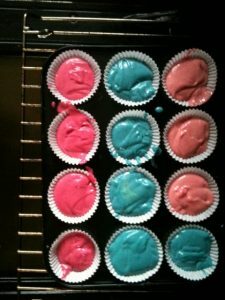 They mixed all three bowls and added some food colouring to each. Tyler added Red to his to mix as he wanted to make pink. So he made dark pink and then added a few drops to make light pink. He told me the difference. Lucas wanted to make blue. So he added in his colouring. This is what they looked like before they went in the oven. Amazing aren’t they? 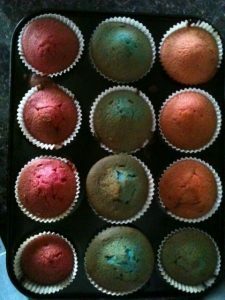 The came out of the oven a little lighter but you could still tell the colours, especially when you bit into one of them. We weren’t finished there. 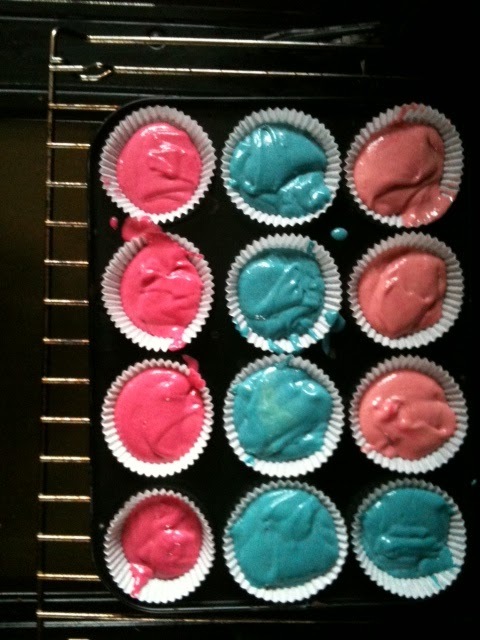 Tyler and I made two lots of icing, one pink and one blue. 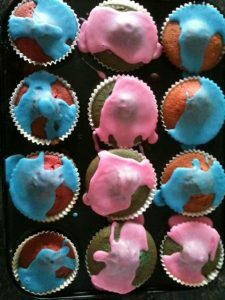 I asked him to pick out the blue cakes and add pink icing, then the pink cakes and add pink icing. He did a pretty good job I think and they were yummy, yummy. This is one of the ways we learn through play in our house. What do you do? **For more great posts on Learning Through Play – hop over to the Tots 100 March Blog Hop.